2018 World Matchplay in Blackpool - Behind the scenes! 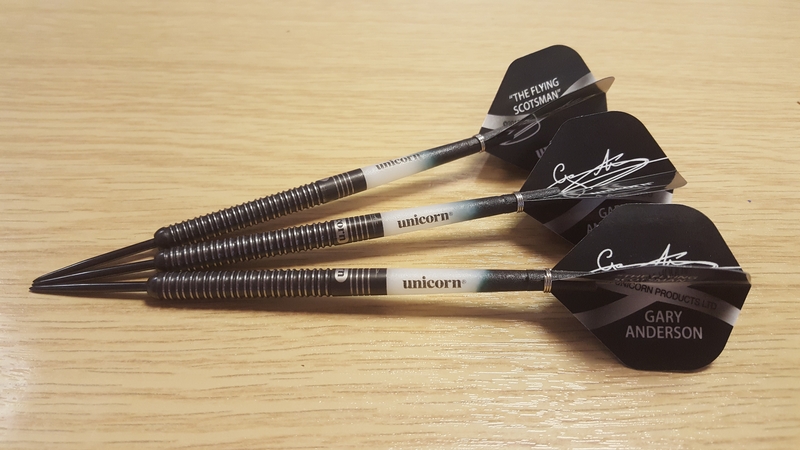 In this blog, Unicorn’s Player Liaison, Matt Rankin, delivers a fascinating behind the scenes insight into the multiple dart set-ups that Gary Anderson used on his way to sealing the 2018 World Matchplay title. In the process, he reveals just how closely Unicorn work with our players day-to-day. It was quite a week for ‘The Flying Scotsman’ by the seaside! 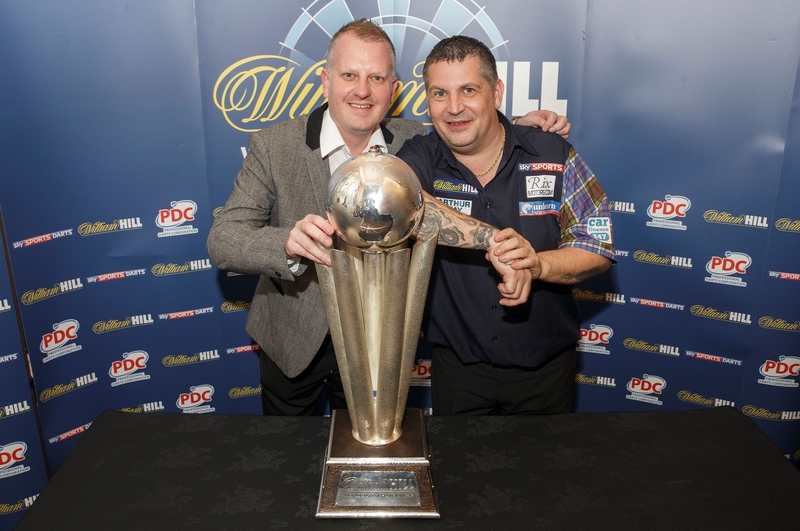 'TWAS THE NIGHT BEFORE BLACKPOOL, when all thro' the darting world, not a player was stirring, not even a Flying Scotsman; the equipment was hung by the dartboard with care, in hopes that the trophy would soon would be there.' The opening section to my blog, sets the scene as to what was about to come over the next 10 days in the world of Unicorn and Gary Anderson! On Friday, the eve of the 2018 World Matchplay in Blackpool, it was settled in my mind that all 10 of our competing Team Unicorn players were fixed-up with their equipment and ready to go for what is, in my opinion, the second biggest ranking event on the PDC calendar. However, then came a text message from Rachel (Gary Anderson’s partner) requesting some sets of his new NOIR darts, some black/white Gripper 3 stems, some black flights and if I could bring them to Blackpool. Fortunately, I managed to find some Of Gary's Black signature flights from his previous range, which were the same as his normal blue ones. I was always planning on going to Blackpool but I had yet to decide on which date, so we agreed posting them was the best option. Our Production Director, Lee Parker, pointed up a set for Gary with his black grooved points, which we do as standard for all the sets we supply to him. 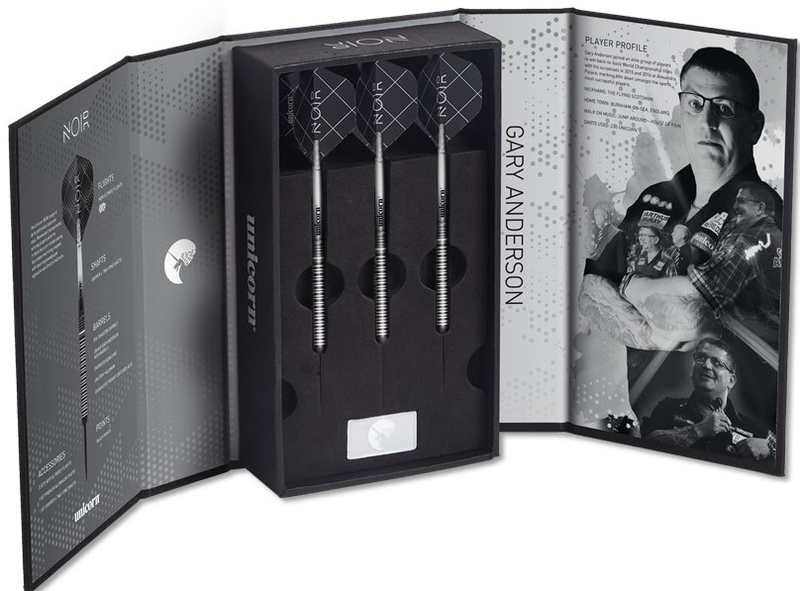 I also sent a set of the darts in the packaging (straight off the shelf) as he hadn't actually seen his NOIR or World Champion darts in the new deluxe packaging as he was having a well-earned holiday with his family and missed our 2019 launch this year! Anyway, the equipment was sent, arriving in Blackpool on the Monday. In the meantime, Gary was in first round action on the Sunday evening against Stephen Bunting, which saw him emerge victorious, winning 10-7 using his tried and tested setup - Phase 3 natural barrel, Gripper 3 Blue/White stems and his blue signature Big Wing flights. As things transpired with results for Team Unicorn in the early stages of the event and the schedule, I decided to head up to Blackpool on the Tuesday evening, for the simple fact that we had four of our players in action on the night; Gary, Jeffrey de Zwaan, Joe Cullen and Michael Smith. It turned out to be an incredible night of action on the oche! I managed to see Gary before his match against Raymond van Barneveld. If you haven't been to Blackpool, the players practice area is upstairs, along with a balcony viewing area for guests and officials. I was watching Michael Smith in action when Gary beckoned me over. ''Matt! Matt! I'm using the new darts, but they've not got my points in!'' he said. Amazingly, Gary was about to use his new NOIR darts, straight out the pack, with standard black points, with Black/White Gripper 3 stems and his old black signature flights. Grooved points are very important to Gary as his finger rests on the point before the moment of release of the dart, giving him ultimate control of where he wants to land the dart. I did remind Gary at this stage that he did in fact have a set with his grooved points, but they were back at his hotel! I get very nervous when our players use new equipment at such big events, even if they have had two or three weeks practice beforehand. But this is Gary Anderson. With three hours on the practice board - I should fear not! An hour or so later and Gary was trailing 5-1 to Raymond. Two hours later, I wondered why I’d bothered panicking at all. The magician that is Gary Anderson went on to record a magnificent 104.17 average to secure an 11-9 victory, winning the match in style by taking out 82 on the bullseye. After the match, I had a long chat with Gary. He loved his new darts and the feel of the new black titanium nitride coating on the barrel. Gary normally uses a new set of darts every 4-6 weeks so, in hindsight, I guess using a new set in such a huge event was all part of The Flying Scotsman's master plan! Thursday quickly came around and Quarter-Finals night was upon us. Gary was facing our Team Unicorn star Joe Cullen, in what turned out to be a superb encounter. As I was settling down to watch the match on TV, I received another text from Rachel letting me know that Gary had again changed his setup. NOIR darts, but this time using shorter stems, 3.2mm shorter in fact. The stems in question were NOIR Limited Edition Medium length Gripper 4 (straight out the pack) and amazingly Gary had decided to use Plus shape NOIR Ultrafly flights, smaller flights than his normal Big Wing. The change of stem length was key because Gary wears glasses, so when he draws the dart back before release, on occasion the flight could touch them. This has the potential to hamper the flight of the dart after release, but by using the slightly shorter stems this issue has been nullified. 3.22mm may seem to the outside world like nothing at all, but in the world of professional dart players any positive change has the potential to make a huge difference and can act as a huge confidence boost on the oche. In my opinion, the way Gary threw in the tournament from this moment on showed much more freedom and fluidity. Not only was Gary enjoying the feel of the new darts, the slightly shorter stems were beginning to pay dividends as only four legs into the match Gary nails a 9-darter and pockets a £45,000 bonus to boot. What a moment! Amazingly, (and I have the proof!) pre-match Rachel said to me via text message, that Gary fancied throwing a 9-darter. Also, I have to add that Joe Cullen showed tremendous sportsmanship throughout and put in a performance that showcased the potential of what is to come from ‘The Rockstar’, with a place in the elite Top 16 players secured for now. Gary eventually prevailed in the match 19-17, but by his own admission missed too many darts at double, mainly at 'tops' with the dart going high of D20. By using the smaller Plus shape flights, as he did against Joe, the dart was flying through the air quicker. Reverting to his Big Wing flights for the next round would always be an option, which would allow the dart a little more drag through the air. Semi-Finals time and Gary would take on our recent signing, Dutch sensation Jeffrey de Zwaan. Gary did in fact revert back to using Big Wing flights, which seemed to do the trick. The Flying Scotsman hit 16 maximums and averaged 106.06 along the way to a 17-12 victory. A special mention for Jeffrey, though, he was incredibly impressive in reaching his first TV Semi-Final, entering the World's Top 50 so quickly after only earning a PDC Tour card back in January this year. Onto the final where Gary would meet Mensur Suljović, with Gary now settled on his new setup - NOIR 23g darts, NOIR Limited Edition Medium length Gripper 4 stems and Big Wing Ultrafly NOIR flights. What a final it was, one of the all-time classics. Our Team Unicorn superstar Gary, prevailing 21-19 scooping the £115,000 first prize to add to the £45,000 9-dart bonus. Not a bad week for The Flying Scotsman! - His victory also completed the PDC Triple Crown as he adds the Matchplay title to his World Championship and Premier League titles. Already this year, Gary won the UK Open title in March and was also victorious on the World Series Tour in Las Vegas. So far, so good for Gary in 2018!